OUTDOOR ADVENTURE. That’s what REI is all about. We help people of all levels of experience and ability enjoy fresh-air pursuits by carrying the best selection of outdoor gear and clothing. Plus, we back it all up with our 100% satisfaction guarantee. Our gift cards are available in both e-mail and traditional-card form. Gift cards may be purchased at REI.com, REI-OUTLET.com, REI stores nationwide, via phone from REI at 1-800-426-4840, and from select grocery stores. Purchases of gift cards are not eligible for the REI member refund. Coupons may not be used to purchase gift cards. No taxes are charged on the purchase of gift cards-applicable taxes are charged when gift cards are redeemed. 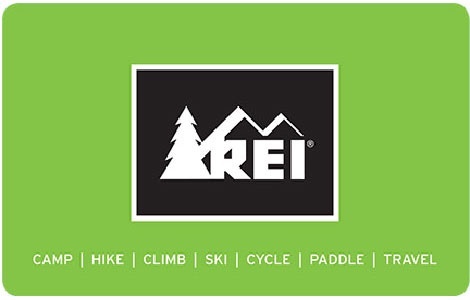 Gift cards and e-gift cards can be redeemed only for future purchases of merchandise or services (i.e., rentals, shop services) at REI.com, REI-OUTLET.com, REI stores nationwide, and via phone at 1-800-426-4840. Upon redeeming your gift card, if your purchase exceeds the amount of the gift card, you will need to pay the balance. (When redeeming online or by telephone, this balance must be paid by credit card.) Gift cards cannot be redeemed for cash (except as noted below or where required by law) and are not refundable if lost or stolen. When redeemed at REI retail stores, gift cards containing an unused balance of $10 or less will be cashed out. When redeeming gift cards, any unused balance (over $10) will be available for future purchases of merchandise or services. Gift cards ordered through REI.com or REI-OUTLET.com will be sent by first class mail at no charge. E-gift cards usually arrive within 24 hours. Gift boxing is not available for gift cards. They're mailed in their own attractive gift envelopes. Gift cards are issued by REI Customer Services, Inc., a subsidiary of Recreational Equipment, Inc. Gift cards may not be resold. Gift cards purchased through any unauthorized resellers, e-Bay or other internet auction sites are not guaranteed by REI. Use of REI gift cards constitutes your acceptance of these terms and conditions.